Express to her just how much you love her when you give her this red garnet and diamond heart ring from Apples of Gold Jewelry. 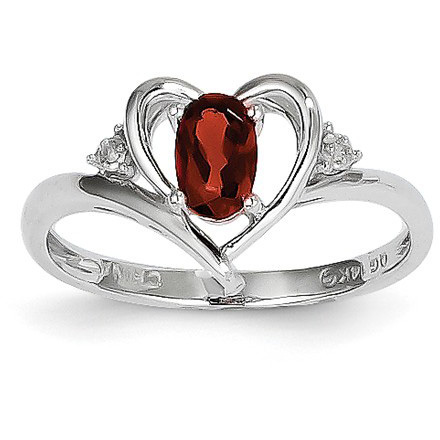 The 14K white gold band features a heart design, which envelopes a stunning, deep red colored authentic garnet gemstone. The gemstone, which measures 6mm x 4mm, is an oval stone with a diamond on each side of it. The diamonds, which add a spectacular sparkle to the ring, total .01 carat, and are situated on each side of the heart of the 14K white gold ring. We guarantee our Red Garnet and Diamond Heart Ring in 14K White Gold to be high quality, authentic jewelry, as described above.